It’s been a week of surprises in Major League Baseball. Jason Motte takes over the closer’s role from Fernando Salas despite the fact that Salas was doing perfectly fine and also happens to be younger. Madison Bumgarner looks as good as his two colleagues Tim Lincecum and Matt Caine and finally, Doug Fister looks like an absolute steal by the Tigers. There has been talk about Jason Motte becoming the Cardinals closer for a few years now and in his last chance to grab the job, he struggled two years ago and again earlier in the season before Fernando Salas took over. Salas has been solid with 23 saves and a 2.47 ERA. The problem here is that Motte has been even better and is a harder thrower that better exemplifies the role of a closer. Motte has not surrendered a run since the All-Star break, in fact the last run he allowed was back in June. Though he is older than Salas, with a 1.57 ERA and 0.91 WHIP, Motte earned the opportunity to impress Tony LaRussa in the ninth inning. We knew Madison Bumgarner was a solid pitcher. He proved this last season when as a rookie he played a large role in the Giants winning the World Series. We just did not know until recently that he could be as dominant as his teammates Matt Cain and Tim Lincecum. Over his last three starts Bumgarner has allowed just three runs to score over 22 and 2/3 innings. He is averaging just under a strikeout per inning and the ERA is down to 2.69 since the All-Star break. Poor run support explains the 12 losses on the season, but at just 22-years old this southpaw is clearly an ace in the making. Coming into the weekend Doug Fister already had the lowest ERA of any pitcher with 12 or more losses. Then he went out and threw the game of his life, offering eight stellar frames while fanning 13 and walking one. The 6’8 hurler was a great acquisition by the Tigers and clearly will have some fantasy value throughout the remainder of the season with a 3.17 ERA. Fister has now allowed just three runs to score over the last four starts, three of which have been wins. He is 4-1 with the Tigers with a 2.64 ERA through seven starts. The Mariners by the way have been happy with Casper Wells while Charlie Furbush has been inconsistent. Like Billy Madison in the movie of the same name, Madison Bumgarner had to go back to school to get his millions. After a lightning-quick ascension through the ranks and up the prospect ladder, Bumgarner had a rude awakening in the upper levels of the minor leagues as well as the major leagues last year. Now he’s gone back to school, spending much of the first half of this season in the minors. So far, so good back in the majors in 2010 as the Bloomberg Sports Fantasy Tools spider graphs show. What can we expect going forward? Last year, Bumgarner was the #9 prospect in baseball and had finished two-and-a-half-years at Single-A with a strikeout rate above one per inning and a booming mid-90s fastball. It almost didn’t seem like he needed any more fine-tuning in the minor leagues, but he went to Double-A anyway because that’s what young pitchers do. That’s when things began to go south. 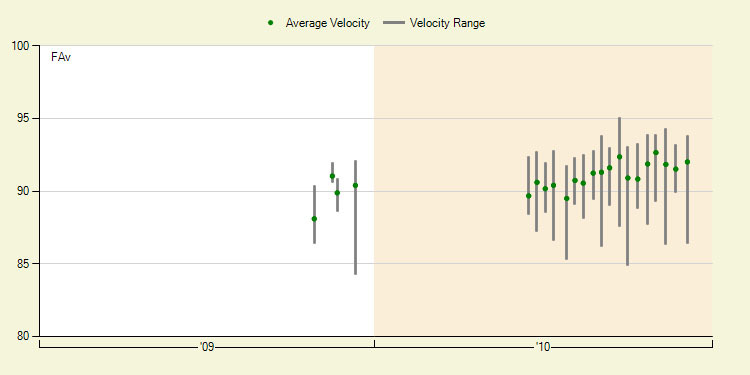 Reports of diminished velocity started coming through, and the results showed that something was off. His strikeout rate fell precipitously, down to 5.8 per nine in AA. The shine was off. The whispers started. A penguin was spotted. Even Bob Barker started talking trash. The Giants called him up for a cup of coffee anyway, and in four games, his strikeout rate looked great (9.00 K/9), and you’d have been forgiven for thinking that maybe this velocity thing was overblown. Bumgarner would graduate with honors if he could put up a strikeout rate like that, even with the caveat that he was relieving, and that relievers usually enjoy a slightly higher strikeout rate. Unfortunately, his K rate masked a still-diminished velocity (89.3 MPH on his fastball), and batters teed up on him often, with a 1.80 HR/9 number that would have to change for him to be successful at the major league level. This year, in Bumgarner’s return to school, he performed adequately but did not recover his former glory on the gun or in his peripherals. His 6.4 K/9 at Triple-A this year wouldn’t qualify him for notice on any prospect list without giving him heavy extra credit for his young age (he’s still only 20 years old). The reason he was able to contribute a 3.16 ERA was the fact that he still doesn’t walk people (2.4 BB/9 in Triple-A and 1.9 career in minor leagues). And while some reports had him regaining velocity with a change in mechanics, his re-found ability to hit 90 on the gun from time to time was not a full recovery. The scouting reports had him as hitting the mid-90s before the mysterious dip. Another way his reduced ineffectiveness was obvious was in the number of hits Bumgarner gave up per nine innings: 9.6. That was a full two hits per nine worse than his previous numbers. So now he’s back in the majors, diploma in hand. His fastball is averaging 90.3 MPH compared to last year’s 89.2 MPH, and he’s only striking out 6.75 batters per nine innings. His 47.6% groundball percentage is OK, but not good enough to mitigate his poor strikeout numbers. He’s not walking anyone (1.61 BB/9), but that’s about the best thing that can be send for him right now… other than his 2.57 ERA. The worst part about his current numbers is that he’s been lucky. He has a .266 BABIP and a 82.7% strand rate, numbers which trend towards .300 and 70% across baseball every year. A few more dinks and dunks should fall in, and a few more baserunners will hit home plate. In short, he has graduated, but not with honors. He looks like a pitcher who can put up an ERA in the low fours and lock down the back of a rotation by not walking batters and having just enough stuff. For more on Madison Bumgarner and other quacktastic young pitchers, check out Bloomberg Sports’ Fantasy Tools.